Home All Articles What if there were points for testing? What if there were points for testing? Testing is generally the first real taste of Formula 1 that fans, drivers and media alike get to sample ahead of the season. The precursory car launches and shuffling of the order gives us an idea of what the season ahead may herald. But after the excitement of new liveries and seeing the strengths and weaknesses of the new cars, testing tends to be a little light on entertainment. I mean, it’s not like there are points awarded for testing. I’m no technical expert. That’s a huge understatement, actually. I’m a man who recently described the new Ferrari SF16 H as ‘looking like a Campino sweet’. So instead of trying to do a half-rate job that Craig Scarborough could eclipse just by saying the word ‘manifold’, I’ve come up with a scoring system for testing. Teams and drivers are given points in two categories; best lap time, and laps total. The laps total table is pretty simple – the more, the better. The total laps are then divided by ten and rounded to the nearest integer. 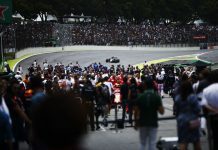 However, for best lap time, drivers will be scored according to their best time, but with tyre choice taken into account. Because of its excess grip, drivers using the Ultrasoft are docked five points; Supersoft drops three, and the Soft compound deducts one point. Medium lap times are not altered, and times set on the Hard tyre are worth three bonus points. Wet tyres don’t change, and a driver can’t be deducted any more points than he earns. So, if someone had the tenth-best time (earning one point) on the Supersoft tyre (which deducts three points), they simply score zero. I know, it’s a little convoluted, but it’s still easier to follow than the actual tyre compound rules for 2015. One final rule; if a team fields more than one driver in a day, both get their points halved. Still with me? Good! Let’s take a look at what this system would look like. First up we’ll look at the ‘Laps Total Championship’, followed by best lap times, and then a combination of both to see who ‘won’ the first test. Mercedes’ absence in WEC continues to baffle us all, as they pumped in well over ten race distances – nearly 2000km – over the first four days. Toro Rosso’s switch back to Ferrari after a couple of years of Renault power saw the naked-liveried STR11 rack up a good haul of laps, as well as Sauber running their upgraded 2015 car. Further back, newcomers Haas, while not exactly setting the world alight, made good progress for their first car, and Renault put in some good laps with Kevin Magnussen, although Jolyon Palmer suffered bad luck with reliability on his days. McLaren are second-bottom, but with 100 laps more during these four days in Barcelona than the entire 12-day pre-season last year, they can at least see some better reliability from their Honda power unit. The new-look Manor team prop up the table, with two crashes for new Indonesian signing Rio Haryanto putting an early end to proceedings on Days 3 & 4. Is this representative of the season ahead? Unlikely – Mercedes are sure to be reliable, and Haas, Manor and McLaren will likely have a tough season, but the graph rather flatters the old Sauber car. Renault look pretty good according to this system, although Force India’s position is skewed slightly due to running three drivers, with GP3 driver Alfonso Celis Jr. taking two of the four days’ running. Let’s have a look at lap times. 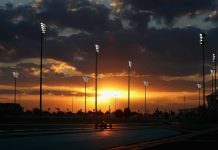 Some Ultrasoft running for Ferrari and Supersoft stints for Force India saw both top the timesheets, with speedy laps for Sebastian Vettel, Nico Hulkenberg and Kimi Raikkonen topping the sheets. Red Bull are the only other team to record a fastest time of the day on the new purple tyres – ironic considering they’ve just ditched the hue when Infiniti headed to Renault. Speaking of whom, Magnussen does well to grab fourth-best time on his two outings, but it’s a disappointing first day for Palmer. Mercedes and Toro Rosso focus on Medium running, with the Silver Arrows opting to split the running to a full day for each driver, and two half days. Other noteworthy times include Romain Grosjean’s soft run on Wednesday which put him second on the timesheet behind Hulkenberg. So what does this lot all mean? Not a whole lot, really; the better times were understandably on softer tyres, and those at the bottom generally had reliability worries. In combining performance (Lap Time) and reliability (Laps Total), maybe we’ll get a better look at what the season ahead could hold. Let’s put the two together! Okay, now that’s more like it! If we take Williams as an anomaly (due to lack of running on Days 1 and 4) and put them ahead of Force India, I think we have an almost-representative look at where the teams could be in Melbourne. McLaren should be ahead of Haas unlike in the table, but it seems like we’re heading for three distinct groups; the front runners of Mercedes, Ferrari and Williams (no change there), the reduced mid-pack of both Red Bull teams, Force India and Sauber, and the ones with work to do. This final group looks like it will contain McLaren, Renault, Manor and Haas – which is pretty amazing, because they all have different power units. Maybe this fight will prove to be the most interesting of the season. For now though, we congratulate Ferrari and Sebastian Vettel for ‘winning’ the first test. It’s a very blonde top four drivers, with a tense showdown in the constructors’. Will things fall even more into shape after the second test, or will the system fail and produce a wildly wrong Pre Season Championship that puts Rio Haryanto on the throne? Find out after the second test!